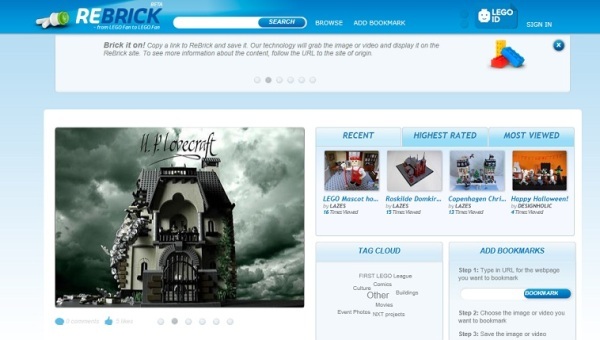 Presenting ReBrick, a social network for an audience spanning from the Lego connoisseur to the individual remeniscing about their childhood bedroom floors full of colourful constructions. Quite literally, it's a Lego social network. Facebook has nothing on such a heartwarming idea. At the moment, functionality is limited to a social bookmark sharing idea: find and post pictures of lego creations for users to either comment of "like." Beyond this, communities can be created, via compatability with Facebook and Twitter, making the setup extremely easy. It maybe basic as it is currently; but as the community expands, we're sure upgrades will follow. And besides, Lego is the definition of 'childhood' to most, so everyone still becomes fascinated at the downright awesome models.